The first stage of digestion has several ways of process. First, is the teeth helps digestion by biting, tearing, crush, and grinding. Next, comes the tongue and the nose they are also helpful by helping to taste food but the tongue also molds food into a bolus. 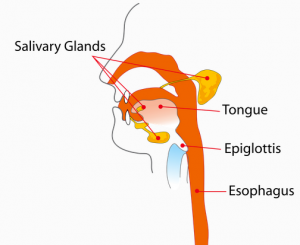 Then, salivary glands is beneficial to outcome the saliva. Finally, the pharynx connects to the mouth to esophagus. And the esophagus leads the food to your stomach. Due to all these facts the first stage of digestion has various steps. There are a few steps in the first part of digestion.First, there are the teeth. The teeth bite, tear, crush, and grind. Also, the nose helps you taste the food. Secondly, the tongue helps you taste the food. Did you know in the first stage of digestion it takes a few steps for the food to go to the stomach? The first thing, you do is smell the food with the nose. Next, your teeth bites, tears, grinds, and crushes the food. After that the tongue and salivary glands turns the food into a bolus. Then, it goes to the throat where the pharynx is located. Finally, it goes down the esophagus and into the stomach. This is how the first stage of digestion is done. I don’t see a concluding sentence Zoe. In the first stage of digestion there are many important steps of process. The first step of digestion is the chewing. This will allow the back and front teeth to tear,grind,and crush the food in one’s mouth. After that the tongue and back teeth roll the food into a ball called a bolus. In additionally is the saliva produced by the salivary glands. The saliva will soon moisten,soften,and helps to break down the bolus into nutrients. Finally, the last step of digestion is the swallowing. Swallowing the bolus transfers it to the esophagus and will down it. Based on these steps of process, the first stage of digestion is needed for specific living things. Do you know were the digestion begins? First of all, when you eat a apple your front teeth bite and tear’s it. your back teeth and your tongue make the apple into a ball called a bolus. Next, when your mouth prouduces saliva it helps the bolus break down into some nutrients. Then the bolus goes in the pharynx to the throat. Finally, the bolus enters the esophagus, a long tube that moves food into the stomach. In conclusion this is the first stage of digestion. The digestion start from the mouth and goes to the stomach. I The First stage of digestion system begins in your mouth. First you bite into something. Then, the teeth cut ,tear and grind food. into small pieces. Your tonge can roll your food into a ball that is called a bolus. Next, the saliva squirts into your food and can make your food soft. The chemicals in your mouth breaks down food into nutrients. The nutrients are small forms of the food that cells can use. It is now time for the to food go down the throat. Last the food enters the esophagus and goes all the way to the stomach. Those are was to that didestiom and the mouth and teeth works. Did you know that when you eat many things happen in your first part of digestion? The first thing, that helps us is Salivary Glands. This helps us to produce saliva. The next, thing is the Nose. That helps you taste the food or smell it.We also have the teeth which does help. Teeth or different shapes bite, tear, crush and grind food.Teeth can be big or small.Additionally, we have the tongue which can help. It helps you taste food and help mold the food into a bolus.The Next, thing that helps us is pharynx. The Pharynx connects the mouth to the esophagus. The Final, step is esophagus. It helps move the food to the stomach. So now you know while you are eating your body is actually doing things. I don’t see an indent for your paragraph Julia. There are a few steps in the first part of digestion. First, there are the teeth. The teeth rip, tear, crush, and grind. Then, there is the nose. The nose helps you taste the piece of food. Secondly, there is the tongue. Your tongue also helps you taste the food. It also helps the back teeth turn the chewed up food into a bolus. While your tongue and back teeth create the bolus, your salivary glands make saliva to moisten and soften the bolus. Then the bolus goes down your pharynx which is connected to your esophagus. In the first part of digestion, a few things happen. In the first stage of digestion when you eat a lot things happen to your body. First of all, say your eating a apple you bite the apple you tear the apple and crush and grind the apple. Secondly, your tongue and the nose come in to play the nose helps you smell and taste and your tongue rolls the apple in a ball of food and molds it called a bolus. Last of all, comes the esophagus. Thats the last step of the first stage of digestion. That’s why the first stage of digestion is very important. The first stage of digestion always starts at the mouth. First of all, you use your teeth to bite, tear, chew and grind the apple. Next, the salivary grand produce saliva to the apple so we can chew easier. Then, the tongue tastes the apple and turns it into a bolus. The pharynx connects the mouth to the esophagus. Finally, the bolus rolls down into the esophagus. The mouth is where the first stage of digestion starts at. The few steps of a digestion can be very interesting. First, you bite the apple with your front teeth. The first stage of digestion has a few steps in it’s process. First, you bite into an apple and tear it Then, your teeth grind and crush it. Next, your back teeth and tongue roll the apple into a ball called a bolus. In addition, your mouth produces saliva that helps moisten and soften the bolus. The bolus then breaks down it down into some nutrients. The bolus then reaches the pharynx in the throat. The bolus enters the stomach.the stomach is a digestive organ with muscular walls. First the front teeth bites and your back teeth grind and crushes the food.Your back teeth and tongue rolls the food into a ball called a bolus. Second your mouth produces saliva.Saliva help moisten and soften the bolus and it starts to break it into some nutrients. the bolus enters the stomach. the stomach is a digestive organ with muscular walls.first the front teeth bites and your back teeth grinds and crushes the food.your teeth and tongue rolls the food into a ball called a bolus. second your mouth produces saliva.saliva helps moisten and soften the bolus and it starts to break into some nutrients.the bolus then reaches to the pharynx in the throat. the bolus then enters the esophagus. the esophagus is long,muscular tube that moves food into the stomach.